After most everyone’s tomatoes are done, mine finally come in. They definitely are worth the wait! These are the only kind I grow. They are a heirloom variety, German Pinks. 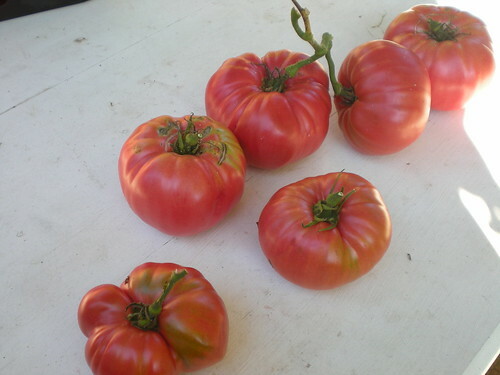 They are huge (can’t tell from the image, but trust me), low acidic and sweet, and very meaty. I save the very best fruits each year for seed, which is difficult, but must keep this variety growing. I think I will go make a tomato sandwich for breakfast. I have three green tomatoes still on the vine from your seeds. Although the plants grew huge, these are the only tomatoes they produced. I’m eagerly watching their “reddening”! Yours are prettier than ours! Almost all of ours are HUGE and look like the one on the left. Like 3 put together!